What is more important for learning a language: grammar or vocabulary? Every one of those will work. 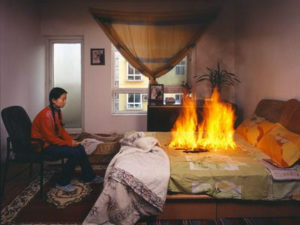 Even though, one all of the mentioned forms is not natural (Допомогти). No one would care about the correct imperative form, the tense, the case, or the gender. Because we pass the message by vocabulary, and grammar just helps to make the sequence of words sound nice like natives would say. So, in language learning, you always start with words, and everything else follows. How many words do I need to start speaking Ukrainian? In Ukrainian, there are 256,000 words! Stop. Do not get discouraged. Language teachers estimate that with around 1,000 words you will have enough to ask people simple questions and talk about the everyday life situations like shopping and transportation. Then, of course, you will learn more words and understand the grammar as you practice the language, but you need to start with that thousand! So, how do I know which words to learn first? Some good textbooks or dictionaries could tell you that. Also, I have created a resource that focuses only on those most useful Ukrainian words and their usage. It is an ebook and a set of flashcards. PDF format that can be used on any device or printed out. Made to be utilized in the Anki app, this application is free for Windows, Android, Mac, and online use. It is for sale for the iOS devices. 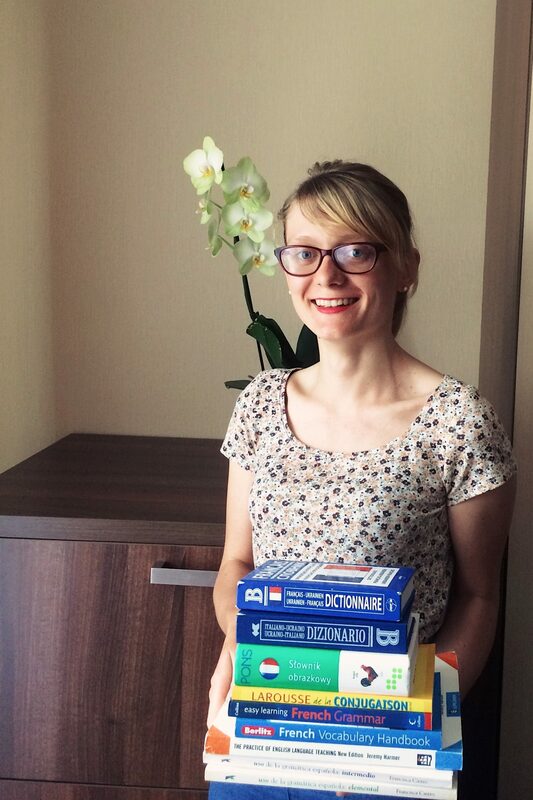 My name is Anna Ohoiko, I am the creator of 1000 Most Useful Ukrainian words and the founder of Ukrainian Lessons. I am passionate about learning and teaching languages. 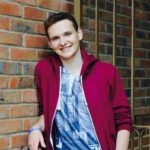 On my path to learning English, Polish, French, and Spanish I have discovered different language learning tricks and techniques to start speaking and understanding a foreign language faster, in the most efficient way. Also, teaching Ukrainian one-to-one and at the University of Pennsylvania has been a genuine experience for me to realize what works the best in language learning, especially for Ukrainian learners. That is why I have created this website, the Ukrainian Lessons Podcast, and the 1000 Most Useful Ukrainian words – to help you learn Ukrainian using the methods that have proven to be effective for me and my students. have a good foundation and feel more comfortable in speaking, writing, reading, and understanding Ukrainian. She is the best language teacher I have ever had! Each lesson is always fun and incorporates a lot of conversation as well as structured lessons that are tailored to me and my ability level. 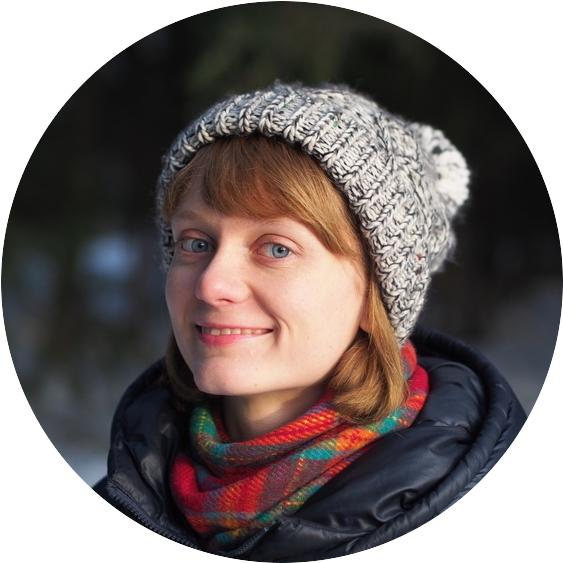 […]The quality of the podcast notes, of the lesson notes, of the website, of the social media handles (Instagram and Facebook are the ones I follow), is so impressive and once you meet Anna, it makes sense. I would highly recommend Anna as a teacher! I have been Anna’s student for 8 months and in that short time, I can honestly tell that she is the best teacher. I learned a great deal from her. • Usually our lessons only in Ukrainian, we only use English if I completely lost, but then she always tries to explain everything in a simple way in Ukrainian so I could understand. See these and other testimonials or leave yours here. Want a little taste of the book before buying? That’s okay with me! Here are the first pages to show you what is there. 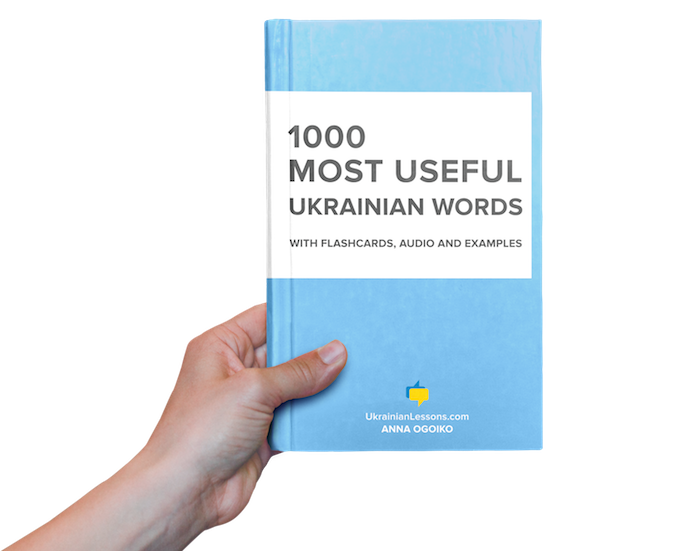 On Ukrainian Lessons, we have another word list with flashcards – 100 most common Ukrainian words. You can download the list of those first 100 words plus the digital & paper flashcards on this page for free! Anna, I just wanted to thank you for your amazing book, I got through every word and have studied your book very carefully and now starting to listen to your podcasts) thank you very much, really. As soon as I get free time, I go onto your website and check every resource there! Thank you very much!! 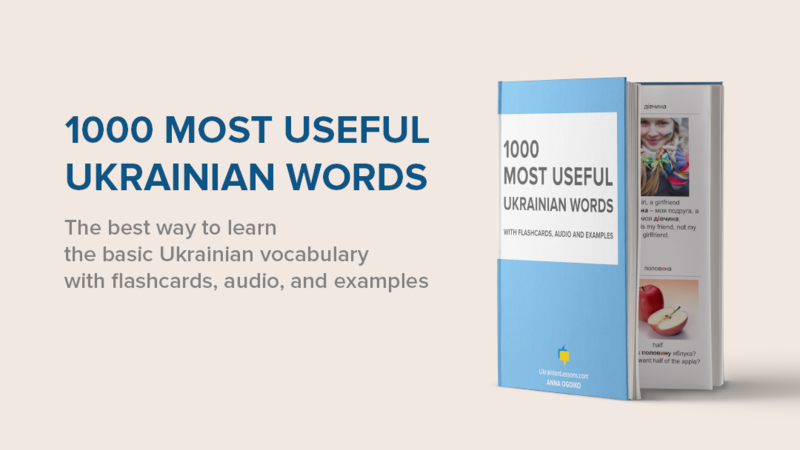 Are you ready to learn 1000 most useful Ukrainian words with me? How were the words selected? Frequency Dictionaries of Ukrainian journalism and fiction (the only Ukrainian frequency dictionaries available for now). The Base Vocabulary of 625 words for starting to learn any language from Gabriel Wyner, the author of Fluent Forever. The words I decided to include based on my experience of teaching and speaking Ukrainian. Which part of Ukraine do the words represent? These are the words of the standard Ukrainian language officially fixed by the dictionaries and used in Ukraine. There are no dialect or slang words in the resource. What is the package I get? 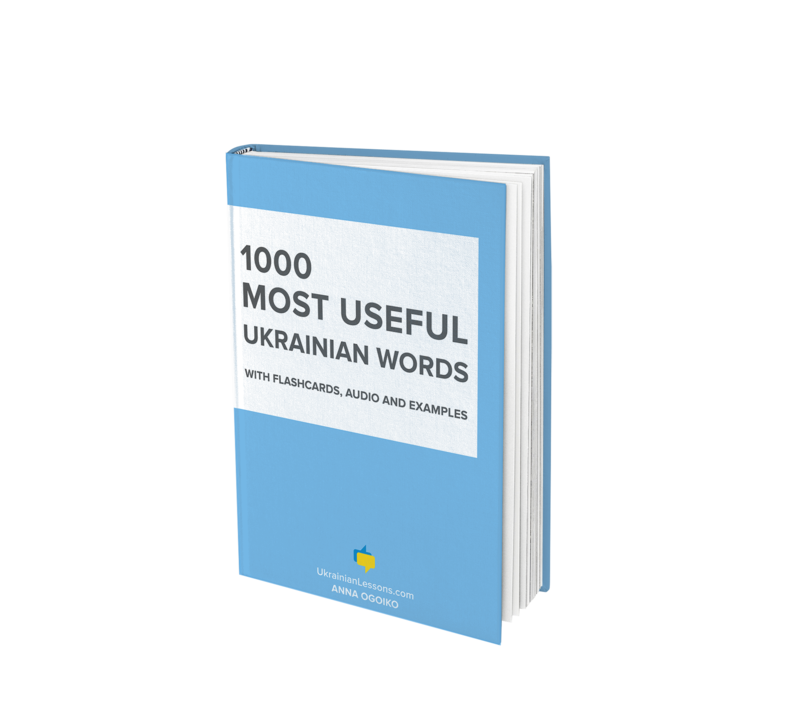 The ebook in PDF: a list of 1000 most used Ukrainian words with translation to English, special forms, and the example sentences to each word. A deck of digital flashcards you can use with the Anki app. There are 1000 flashcards there with the words, translation, pronunciation audio, pictures, and examples. You can also edit the cards and add your own ones. How do Anki flashcards work? You are provided with the details about this product. You also have access to the sample of the book and flashcards. This is a digital product. So, as soon as payment has been made, the customer can download all associated content. For this reason, we do not offer refunds on this product. Do you have any questions or payment issues? Please, let us know below.